The Amano PIX-3000x is a multi-purpose time recorder designed to handle all of your essential time recording needs. The PIX3000 is the most versatile and feature-enabled electronic time clock available. 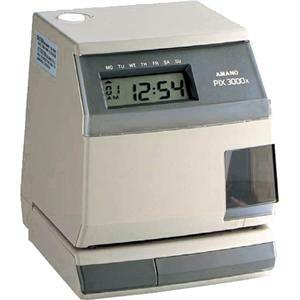 As a time clock, the PIX-3000 prints the time and date on card or job tickets for calculating payroll or costing jobs. The same unit can also be configured to append comments to the time and date, making it an ideal choice for stamping important documents. If your applications requires the unique identification of documents, the PIX3000 can even be set to operate as a numbering machine, printing up to six-digit numbers that advance based on your settings. Automatic semi-manual, or manual print with choice of left or right hand print. Adjustable print depth guide with a maximum print depth of 1.2 inches. Choice of hour formats (12 or 24) and choice of standard minutes, tenths or hundredths with 2 or 4 digit year inclusion. Imprint configuration options to include seconds..
Automaticallly change for long and short months, leap year and Daylight Saving Times. Consecutive numbering print configuration (6 digits with up to nine repeats). Optional Signal Relay can be added for programmable circuit closure for sounding bell or horn. Dimensions: 6.9" x 5.9" x 6"